Fonterra's forecast milk price of $4.60 per kilogram of milk solids for its farmers is looking under renewed pressure after another sharp fall in global dairy prices overnight. 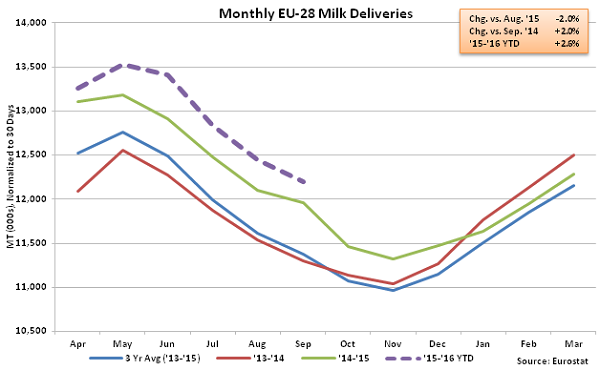 The third consecutive fall in prices saw the GlobalDairyTrade Index drop another 7.9%. It's now fallen a cumulative 17.3% in the past three auctions after four consecutive auction gains had seen it rise 62.8% from the lows reached on August 4. The index is now just 34.6% above those lows. 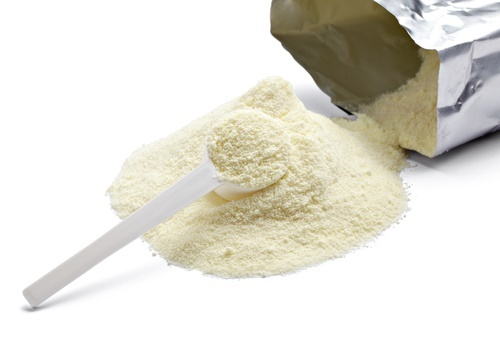 But the news is rather worse in the key Whole Milk Powder prices, which slumped 11% overnight to an average $2148 per metric tonne. These prices are now down 23.9% since October 6. A large part of the 77.6% gain in WMP prices from the lows of August 4 has been eroded, with prices as of last night now just 35.1% above the August lows. Fonterra was sticking with its $4.60 milk price forecast when it gave a market update earlier this week, which included lifting the potential dividend payout by 5c. Fonterra will have known at that stage that this week's auction results would not be favourable, as NZX Dairy Futures trading had pointed to further falls. But chairman John Wilson said the co-operative was still looking for a move up of dairy prices in the first half of 2016 - and the $4.60 forecast was based on that continued expectation. AgriHQ dairy analyst Susan Kilsby said the NZX Dairy Futures market shows very little upside for dairy commodities through to the end of the 2015-16 dairy season, with WMP prices now only expected to reach US$2400/t by July 2016, after having fallen US$400/t in the past fortnight. “The current outlook for the dairy markets means Fonterra’s milk price forecast of $4.60/kgMS is now under considerable pressure,” Kilsby said. ANZ senior economist Mark Smith said the low run of dairy prices "looks set to consign the dairy sector to another dismal season and the key for Fonterra’s current $4.60/kg MS milk price forecast will be how long the current downtrend persists". ANZ has been forecasting a milk price for the season of $4.25-$4.50. Westpac senior economist Anne Boniface noted that the Fonterra forecast was still contingent on some improvement in prices over the remainder of the season. "This is something we continue to regard as likely – despite the direction of recent price moves. New Zealand dairy farmers are yet to feel the full brunt of an El Niño weather pattern but milk production (for Fonterra farmers at least) is already running 4% behind last season thanks largely to early culling of stock and reduced spending on supplementary feed. Fonterra continues to expect it will be down 5% over the full season. "Reflecting this, and a change in mix of product offerings (amongst other things), Fonterra has continued to tweak its forecast of WMP offered on the GDT platform and expect to offer 5% less via this platform over the next 12 months than it was projecting a fortnight ago. While this appeared to do little to support prices in last night’s auction, if El Niño does hit milk production, we suspect it will lead to a bounce in prices, albeit a temporary one." Westpac economists are currently picking a $4.50 milk price for the current season, which is the same as the BNZ. ASB economists have tended to be about the most upbeat among the large bank economists and kept their milk price forecasts higher than others at a time when global prices were really plummeting earlier in the year. However, they've now dropped their milk price forecast as well, from $5 to $4.60. "Although we expect prices to eventually end the season higher, these weak auctions have added up," ASB rural economist Nathan Penny said. He noted that the season was nearing the half way point in terms of auction volumes sold, with a little over 40% of WMP sold so far. "As a result, we trim our 2015/16 milk price forecast by 40 cents to $4.60/kg. However, note our 2016/17 milk price forecast remains unchanged [at $6.50]. In other words, we continue to expect dairy prices to recover over 2016 and dairy’s overall prospects remain positive. "This auction result reinforces our view that the Reserve Bank will cut [the Official Cash Rate] by 25bps [to 2.5%] in December. "Moreover, we continue to see potential for further cuts over 2016." Are they not in the midst of an election? For as long as Fonterra has been in existence, each director election seems to illicit a price rise in the face of bad news. It goes without saying though it would be less than helpful if Theo an John were out there bemoaning the dreadful outlook. Their job demands positivity does it not....they are salesmen, they need to talk it up. I am afraid that when your customers have been rooked, overcharged and had their interest returns and wages cut to pay for your profligacy, then you can expect more and more cuts. This is not just an NZ problem, but a worldwide one. It is not just in Dairying. It is caused by compounded debt. Not so much ours, the little people, Yours. The customer is always right. Especially in this case. I know, I am one. If we turn our nose up in disgust, at NZ pricing, it is over previous Fonterror milking us over the past few years. Not just in Milk, both dried and wet, but in the cheese processes too. $75 per kg for a bit of cheese is laughable. Ask a French man, what he can buy for that. Houses will be next. Some people have bet their lives on it. As did some Farmers who got in late. The law of diminishing returns applies. (Even when sales are booming to overseas previous customers, with cheap credit, they have to draw their horns in one day and it is now, debt is infinite to some, money isn't). Not something that you people in Finance would understand. Alibaba made more in one day online, than this country can understand or make in one year, catering for the mass market. And not in everyday commodities. He needs a better return from Oil, go figure. When your best customers turn on you, you cannot plead diminished responsibility when incomes recede. But when more of them do, it suddenly becomes apparent. 2008 was a turning point and nobody, repeat nobody, even predicted that. Well here is my prediction, get used to it. Putin was beginning to and felt the need for a change. Dairy and other Commodity suppliers cannot compete with each other with debt infinitely. Especially when paid in kind. These predicted rate cuts will be great as my mates are dumping their increased overdrafts onto mortgages ! I just hope their equity dosent take too much of a knock in the months to come as all hell will break loose if it does !! Total quantities sold for all products at the November 17th event of 30,044 MT were 11.6% below the previous auction and the least product sold since June. What is happening to the rest then - is it forming a massive put against future prices? Mr Paravicini said Fonterra's decision to sell its Bega stake had no implications for its long-standing relationship with the company which includes a license to sell the Bega brand in Australia and a cheese supply contract to Bega. "The Bega brand has an important role in our cheese portfolio where we are a market leader," he said. It seems our new CFO is more adept at picking out the 'wheat from the chaff' investments Fonterra has been involved with, than his predecessors. He has more 'street cred' than some who have gone before him. Two or so years ago we were told that the DFA partnership was not working out as hoped. According to Eurostat, Sep ’15 EU-28 milk production increased YOY for the sixth consecutive month, finishing 2.0% above the previous year and setting a new production record for the month of September. The recent increases in production have corresponded with the expiration of the EU-28 milk production quota system at the end of Mar ’15. Monthly production growth had decelerated throughout the six months leading up to the quota expiration as over-quota producers attempted to limit superlevy penalties for exceeding milk production quota levels.